I wasn’t going to put up a tree this year. A busy year with a lot going on so the spirit of the season had passed me by. Then I saw this funky little tree that looks just like a feather tree. It called to me. A week later I went back and bought it. It sat naked by the fireplace for another week. 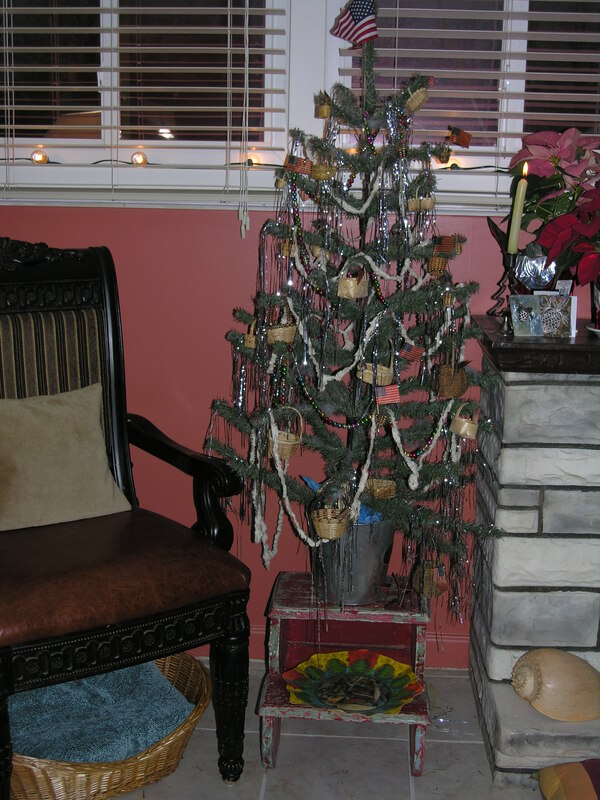 Today we put it into a galvanized pot and sat it atop a little red stool that belonged to a neighbor who has passed, decorated it with antique mercury glass ball strands, tiny baskets, little antique flags, strands of chenille that look like popcorn and finally some tin icicles. It has a little of both Ron and me in it. We both love antiques, I collect baskets that are mostly splint oak handmade baskets, and we are a retired Army family so the little flags are perfect. Maybe this little lonesome tree will be our new tradition. Not too big, not too small, but just right. It finally looks a little like Christmas inside . Outside snow is still on the ground and the holly and nandina are loaded with red berries.